I was reminded of this today when I came across a post by Matt Asher. He blogged about his frustrations with Kobo and how much of a pain it was to buy an ebook and load it on to the Kobo Aura HD. 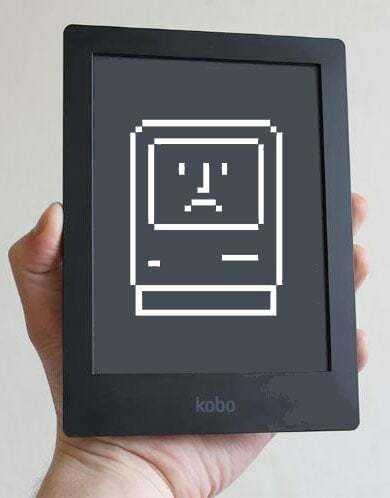 Figure out that you need to use their software to download the book, which you already have installed because the Kobo required that it be installed just to begin using the ereader when you first purchased it. Connect the ereader to your computer. When the Kobo software demands to be upgraded (not suggests, demands), do an upgrade. Try the upgrade again after it appears to fail on the first try. Once Kobo software is back up and running, log out of your old Kobo account since that one used an anonymous spam-catching email because there was no reason why you would want Indigo Inc. to know all your books and reading habits. Still in the Kobo software, log in to the new account you created to purchase the book. Read with incredulity as Kobo informs you that you will loose all existing books on your Kobo Aura HD once you sign in with this new account. Backup all your ebooks just in case it really does this. Sign in to confirm that you accept this. Sign in again when the same message pops up. Optional: get upset with yourself for not returning this damned device before the return period ended, especially since its software is absolute crap for reading PDF’s, that is to say the format of most ebooks you already have on your computer. When the Kobo is finally done updating, unplug the device to see if it really did clean off all of your books. Go through the whole setup procedure for the Aura HD again, because apparently it not only deleted your old books, it did a full format/reset. The thing about this list is that it details user experience problems that Kobo has inflicted upon readers with their first apps and ereaders and which are still present to this very day. Ask anyone who has dealt with Kobo and they will tell you that this list is quite familiar. I can attest to that just from my own experiences. When the ereader demands to be upgraded (not suggests, demands), do an upgrade. When the ereader demands to be upgraded AGAIN (not suggests, demands), do an upgrade. I can understand Kobo demanding that I install an update, okay. That demonstrates a lack of respect for the user but I can understand the desire to have the latest software installed. What I can't understand is why Kobo can't be bothered to keep the Wifi and account info rather than wiping it during an update. Amazon certainly seems to be able to pull it off; what makes them so special? Heck, Amazon is so good that they can install an update without my even noticing. My KFHD was updated to the latest firmware without any fuss, which is exactly how it's supposed to happen. Buying ebooks are also a heck of a lot easier via Amazon than via Kobo. That has been true since the very beginning. Perhaps if Kobo didn't have such a terrible user experience, maybe they wouldn't be in 5th or 6th place in so many markets. Say what you will about Amazon, but their stuff works. I have ranted on a few forums about my experience with Kobo Mini. I was visiting USA and I kept returning to Best Buy to see what they had on sale. You see … computer stuff is much cheaper in USA than in my country. So … I was browsing BestBuy e-book reader and tablet section when I saw Kobo Mini. At that time I did not need another e-ink reader, but I wanted to buy it. I just *loved* the form factor. I was looking for an excuse to buy it, even though I was well aware of problems that their firmware for other models have. At the end, I did not buy the little reader. I couldn’t start it to have a look at the system, library, how it presents the text. It just kept DEMANDING to be connected to the Internet to be registered before it let you have a peek at the system. Sigh … several weeks later, there was the same lone Kobo Mini on the shelf begging to be connected. Obviously, they did not persuade anybody to buy it. I have 2 Kobos (a Glo and a Mini). I have never downloaded or installed the desktop software. That is no longer necessary. Once it’s registered, turn off wifi. You never have to turn it on again. I have side loaded a couple of updates, and that did not cause any loss of data or registration. For people who like to side load books, the Kobo Glo is better than the Paperwhite. That’s just one of the ways to set up a Kobo ereader. And if you don’t have access to Wifi it’s the only way. Same here, don’t use their software, I use Calibre and it’s as easy to put a book on my Kobo as it is a song on my iPhone. I’ve also never had to re-enter my internet passwords or anything after an update. Same here, I’ve had a Kobo Glo since they first (finally) sold them in the US, been through a dozen firmware updates and it’s never forgotten my wifi setup (or demanded to be upgraded – it just says to reboot whenever you want and it’ll upgrade then). I couldn’t be happier with it and don’t understand all the complaining. It gets a little slower to boot up with every upgrade but as I rarely power it all the way down it’s not really an issue. I’ve also never installed the desktop software, just configured it all on the device. Maybe it’s more of a hassle for people without wifi? I agree with Anne, and I never use my Paperwhite 3G. A product that is at its best when *not* used as designed? Sounds like it needs a redesign. Reminds me of the Hanlin readers that worked far better with alternate firmwares than their out-of-box experience. I’m still using it as an ereader, nothing different there. But the same way I’m using calibre to place books on my kobo is the same way people use calibre to place books on their kindle. Sony and Barnes & Noble also have working e-readers. The only problems I have ever had with either of them are DRM related (as in, due to my fiddling with it to get it on them). I was considering getting a Kobo until I saw this post. Are there some Kobo models that are less frustrating than the Aura specified here? And I know it would be mostly speculation, but what’s the chance that of the new models coming out next month might be less troublesome? Thanks for any additional info or insight you can share! Never had a problem with my Kobo e-reader. I have a pretty old one, and I am thinking of moving to the latest Aura. I never had the need to connect to desktop or anything. Yes, I did have to set up an account, that’s no big deal. For tablet-like formats of Kobo, they all run Android nowadays – so you can’t really go wrong with that. The Kobo is easy, well if you have a computer. I recently bought a Kobo Aura HD and i could not be happier with it. It is nice to constantly listen to my frustrated colleagues with their Kindles and all its restrictions. Certainly never had to use the Kobo software just Calibre that works really smooth.